Advance Tool to Preview Multiple MBOX File along with Attachments. Viewing MBOX Emails without Origin Email Client Required. Proper Indexing of MBOX Emails to Make the Search Process more Faster. Analyze MBOX files created using Gmail Takeout, Thunderbird, etc. Open and preview all MBOX email files with absolute formatting. Emails are listed with their respective properties such as; Subject, To, From, Sent Date, Received Date, & Size in Bytes. The tool has a default view mode of the screen as horizontal but if needed, the screen can be viewed in vertical mode. Just go for the Switch View option to change it accordingly. MBOX Email Forensic performs instant scanning of each .mbox file and maintains a proper catalogue of its emails with appropriate folder structure which helps user to easily analyze mbox file. Also, the user can also get a detailed preview of the scanning process with file size and creation date. The tool has an in-built viewer which initiates preview of attachments for corresponding emails present within the MBOX file. Meanwhile, the tool will also display data items of each email along with its corresponding attachment types such as; image, documents, .ppt, etc. 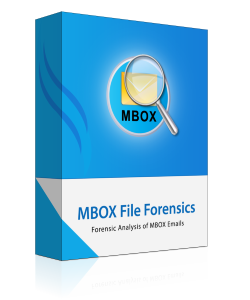 MBOX Email Forensic tool is renowned as best to open and view MBOX emails on a local machine independently without any compatible email client installed for the same. The tool has an intuitive user interface built without any complicated options which makes it easier to examine any MBOX Email File. Even a non-technical person can easily operate it without any help or complication. DEMO version allows you to scan, add and preview the evidence available within MBOX files. To export evidence in PDF, PST or EML, go for PRO version. Upgrade to MBOX Eamil forensic Pro for Advance Search & Export Option. Can I use the software on my Windows 8 Machine? Yes, the tool will allow you to examine MBOX files on any version of Windows. What maximum file size does the tool support? There is no such restriction imposed by the tool while to examine MBOX files. MBOX Email can be easily open and view without any corresponding email client environment! It was really a great news for me. It’s true the software MBOX Email Forensic Tool can be the best choice for the excellent software solutions I worked with. MBOX Email Forensics software can make it finest choice for the examiner to give the perfect analysis of MBOX file. It is great support for litigation leading attorneys as well. I have decided upon looking forward to availing more services from Revove Group.